If you want to stay in, keep high levels of cash, trade in small amounts, and stick with short-term trades. Buying into a 4% counter trend rally lasting 2-3 days could mean getting caught in a nasty reversal that may head down 8% in hours, asserts Joe Duarte, MD. We may not be in a bear market by the numbers but may be in a bear market… in spirit. As a matter of fact, this is one of those periods where the stock market is no fun for anyone and where the misery seems ready to last forever. So even while the bulls are feeling the pinch of the current correction, and the bears are still growling relatively quietly, this currently isn’t a bear market by the numbers. In all honesty no matter what you call this market, the real question isn’t whether this is a bull or a bear market, but whether the selling is going to get worse. In fact, bear markets – often described as periods where prices are 20% or more below the market’s peak – are usually recognized in hindsight when they are well-entrenched and most investors have lost significant amounts of money. As things currently stand, the S&P 500 500 is down 9.3% from its January 26, 2018 high, while the Nasdaq 100 down 10.5% and the Dow Jones Industrial Average down 10% from their respective highs. 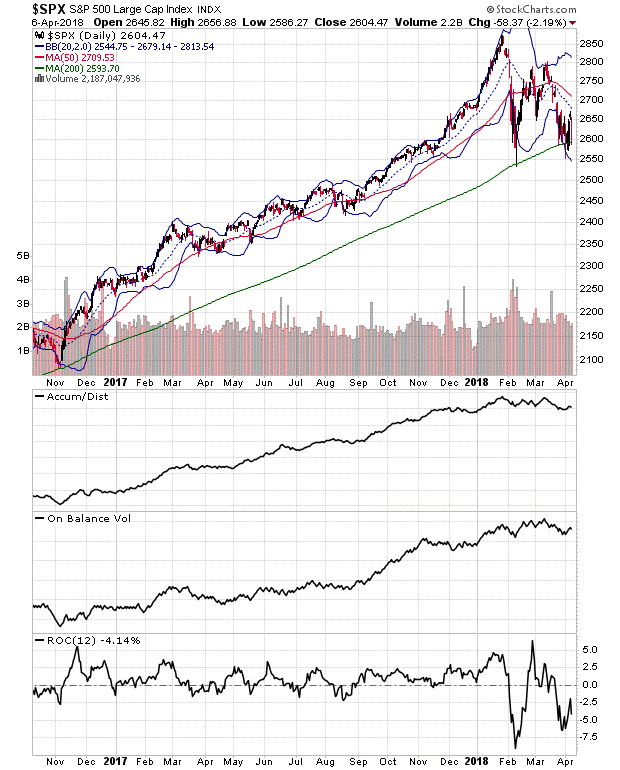 Moreover, none of the major indexes have broken decisively below their 200-day moving averages, the traditional dividing line between bull and bear trends. One is the fact that almost everyone is now bearish, while the other is that the market is trading dangerously close to what traditional markers describe as the threshold of a bear market – the 200-day moving average of the major stock indexes. This, of course, raises the question of whether we are near the proverbial market bottom which is often marked by such thick bearish sentiment as what some indicators are currently measuring. The flip side is that sometimes the bears are right and this may be one of those times. Whether this is a bear market or otherwise the New York Stock Exchange Advance Decline Line (NYAD), the most accurate indicator of the stock market’s trend since the election of Donald Trump looks very tired. And if this pattern of lower highs and lower highs continues, the most likely outcome is a further decline in the market. The worst aspect of the NYAD chart as of the close of business on April 6, 2018 is the confirmation by three oscillators – RSI, ROC, and MACD – of the exhaustion of the upside momentum generated from the late February bottom. Indeed, if NYAD breaks below its 50-day moving average it would not be surprising to see it test its 200- day moving average and perhaps fall further. Of course, the way the market has been trading of late, this could happen in a day or two. If that was the case, there is no telling as to what may follow. Over the last few years, the 200-day moving average has been ignored as a major indicator of the long- term trend. But as with all things in this market, the once venerable indicator could soon regain its significance. This could manifest in a couple of ways. 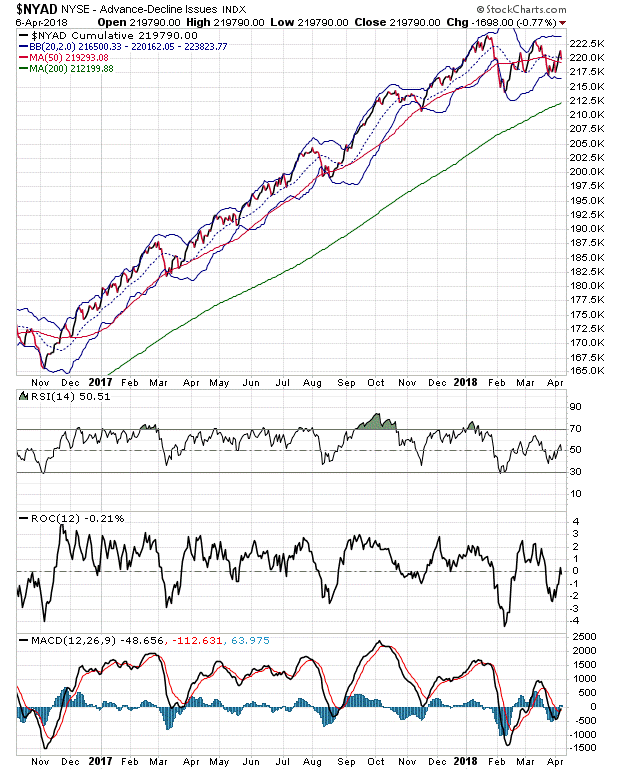 First, SPX could crash below this key line and continue to even lower levels. If this happens, then we would know we are in a bear market. On the other hand, the 200-day moving average, as it has been many times in the past, could be a great place for a fake-out. If this scenario plays out, we would see a break below the line, which would last for a short period of time and in hindsight would prove to be the proverbial bottom to the current correction. But while it is important to consider those two potential outcomes, at this point all that is pure conjecture. Based on current data, there are four significant findings on this SPX chart. First, the index closed at its 200-day moving average on April 8. Next, momentum and money flow indicators, ROC, OBV, and ADI, and raw volume seem negative. The first three are in short-term down trends, and the fourth one, raw volume has more pink bars (selling) than grey bars (buying) in the last two weeks, while the pink bars are higher than the grey bars. A bear market in spirit is a tough market to watch, much less to trade. Indeed there are few alternatives at the moment other than to stay patient. Until proven otherwise there are more sellers than buyers in this market, although this could change at any moment. Indeed, for all anyone knows we may have already hit the bottom or may be close to it. The point is that in this market, only one thing seems clear; the risk/benefit ratio is completely tilted toward risk. Joe Duarte is editor of Joe Duarte In The Money Options.